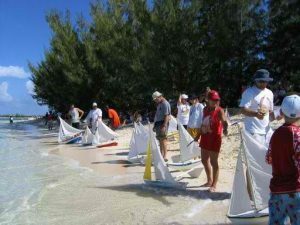 The Middle Caicos Sailboat Association proudly presents the 17th annual Valentine’s Day Cup Model Sailboat Races! 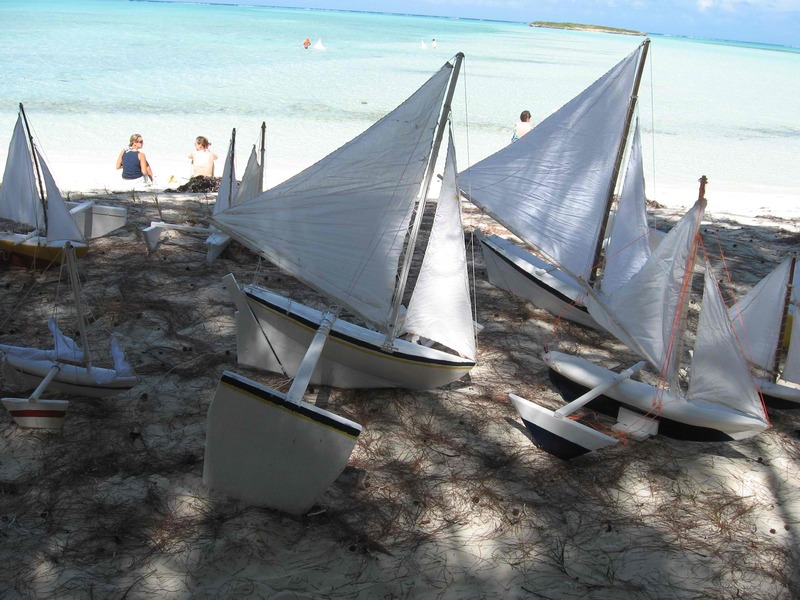 Bambarra, Middle Caicos, decided it was time to bring back the traditional sport of his childhood, racing hand carved gum-elemi model sailboats. Together with Brodie Forbes, and noted boat builders Headley, Marcus and Carlin Forbes, the plans were made, boats carved, rigged and painted – and the first event held for a new year race, in January 2000. From that date, over 70 boats model sailboats have been carved and sold, with the current fleet on hand of about 25 boats currently under reparations for this year’s race. The all-day event in 2017 is on Saturday, February 18, with food, fun and music on the beach from 11 am until dark. 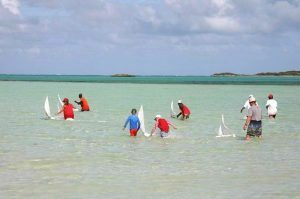 It is truly a local community event, with all of Middle Caicos participating somehow, carving or rigging sailboats, preparing food for the beach, playing live music, organizing transport, racing the boats and cleaning up afterwards! It takes a lot of energy, goodwill and local participation to keep this unique Middle Caicos festival alive. The Church of God of Prophecy, Conch Bar has served hundreds of folk delicious local delicacies on the beach each year since 2004, and funds raised go to their youth and women’s programs. The Middle Caicos Co-op handles the promotion and advertising, while Middle Caicos Co-op Services does all the co-ordination and administration. Forbes, Forbes & Forbes Ltd, Conch Bar continues as the major sponsor for the event each year, with Big Blue and Amphibious Adventures of Provo bringing visitor groups and organizing the races on the beach. PPC, TCIG Department of Culture, have all been major contributors over the years, with countless small donation and services from individuals to keep things always moving forward. Individual sponsors may also purchase boats in the fleet, painted with their name and colours, and support the model sail boat event in this way. While a very small festival by country standards, it is a great day, and beloved by those who find their way here. The model sailboats begin as a section of the gum-elemi tree – the longer and straighter the trunk, the bigger the boat possible. As of today, “The Rocket” at 56 inches, is the largest and fastest in the fleet, never having been defeated since built in 2005. The majority of the model sail boats measure from 20-40 inches, and each carver has a signature shape to the hull. 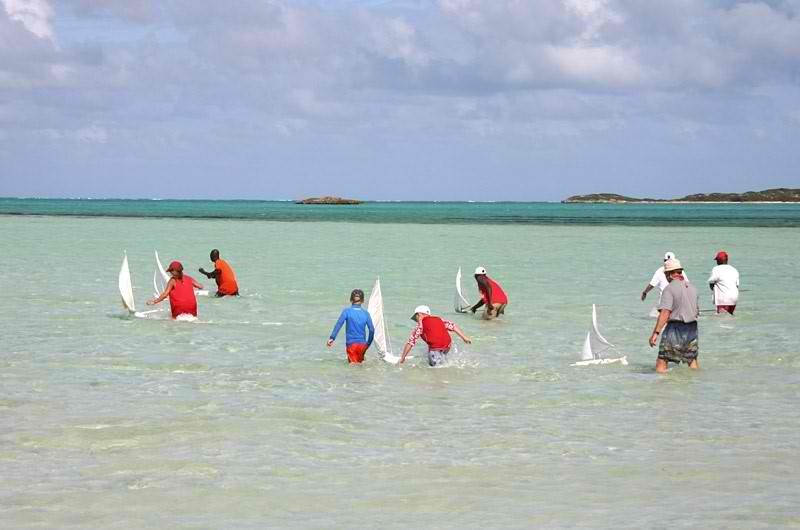 To the delight of Daniel and Brodie (founder and chairman respectively of the Middle Caicos Sailboat Association), boats from other islands entered the races with captains from 10 to 75 years of age. “The Eagle,” captained by Tino Robinson of Provo, championed the small boat category for four years – and each year he was the youngest captain too! Carlin Forbes continues to capture the “oldest” captain award, racing his own hand carved model sailboat each year. Getting to Middle Caicos for the day now is a breeze. From Walkin Marina at heaving Down Rock in Leeward, Caribbean Cruisin’ (946-5406) has all-day ferry service to Sandy Point, and taxis or rental cars are available from there to get you to Bambarra beach and back. The public site on Bambarra beach is one of the loveliest in the TCI, with great shade under the casuarina trees, latrine facilities, shallow sand beach for kids, tiki huts and a bandstand. If you always thought about taking a trip to Middle Caicos, this is the time to do it. Saturday, February 18, for the 17th Annual Valentines’ Day Cup Model Sailboat races!!!! Email middlecaicos@tciway.tc for more info as needed.